I went to the Louvre on Wednesday, and as every tourist does, I did the rounds. i.e., the Mona Lisa and the Venus de Milo. I have to say, all the hubbub over these two items left me scratching my head. To get to the Mona Lisa, you have to go into the Italian Painting section, pass by a few Botticelli’s, Giotto, Cimabue, and some of Leonardo’s better work (in my opinion) like St. John the Baptist. People just blast by these incredible pieces of art as if they were post it notes just to cram into a room to see a painting of a rather plain, barely smiling girl. It boggles my mind. I have been to the Louvre before, when I was in university years ago, in a galaxy far, far away. I thought maybe I hadn’t given it a fair shake in my early 20s, so I’d diligently try again and attempt to see what others see in these two items. And…nothing. I was rather unimpressed. It was impossible to get a close look at the Mona Lisa and when I finally did, she just didn’t do it for me. Same with the Venus de Milo. It was in a room full of incredible sculptures and I thought, “Why all the flap about this armless wonder?” If you’re an ancient historian, a medievalist, or early modernist, there are so many other amazing pieces and works of art a the Louvre other than these two tourist staples. Here is my list of cool, creepy, unusual and better than the Mona Lisa at the Louvre in Paris. 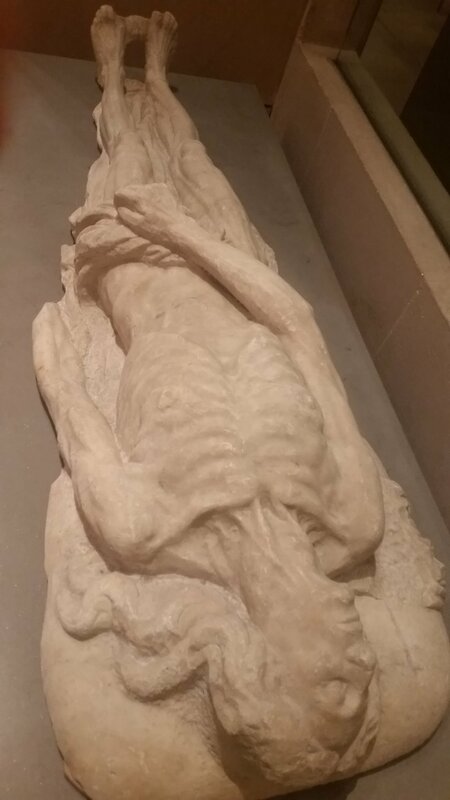 This frightening image of Death found at the Louvre once stood at the centre Saint Innocents cemetery in Paris. The cemetery was known for housing mass graves and was in use from the High Middle Ages until 1780, when it was closed due to overuse. In 1786, the bones were moved to the Catacombs in Montparnasse. I visited the Catacombs while I was in Paris and was able to see why why they had to move the remains – there are so many bones it’s unbelievable! Catherine de Medici (1519 – 1589) was the wife of King Henry II of France (1519 – 1559). She was born into the powerful Florentine Medici banking family and married Henry at the age of fourteen. Her marriage was quite the sham; Henry openly took a mistress early on, Diane de Poitiers, a woman almost twenty years his senior. Catherine was forced to sit on the sidelines until Henry’s accidental death at a jousting tourney in 1559. Catherine promptly banished Diane de Poitiers after his death and began her career as a ruthless regent for her three sons, all of whom died young: Francis II (1544 – 1560), Charles IX (1550 – 1574) and Henry III (1551 – 1589). She was blamed some of their actions, like the infamous Bartholomew’s Day Massacre in 1572. She survived two of her sons and died 8 months before Henry III’s death at the hands of an assassin. Although she died in 1589, she commissioned this impressive funerary statue of herself in 1565 by Italian artist, Girolamo della Robbia (1488-1566). The statue now sits in the Louvre’s medieval section. Here we have Catherine de Medici’s grandmother! It looks like not only Catherine got a raw deal in the marriage department – Joanna was 22 when she married 61 year old John II, Duke of Bourbon (1426 – 1488) in 1487! He died the following year and a still young Joanna remarried at age 30 to John III, Duke of Auvergne (1467 – 1501) on January 11 1495. Their daughter Madeleine (1498 – 1519) was Catherine de Medici’s mother. Her tomb caught my eye with its grotesque depiction of death. Joanna looks serene while her entrails are worms spill out of her desiccated body. Disturbing, yet lovely at the same time. Worth seeing while you visit the Louvre. It’s not every day you see someone carrying their head, so this statue made me do a double take. Who was St. Valerie? She was a Roman period martyr since headless saints were “a thing” then. The story is that she was forced to marry a Pagan and when she refused, she was beheaded. That’s a pretty harsh way to take rejection. She then carried her head before the bishop who converted her. Head carrying saints were common in France, most notably, France’s patron, Saint Denis was part of this cephalophoric club. This alarming statue at the Louvre depicts St. Valerie holding her head accompanied by two angels. En route to the Mona Lisa, you pass by this amazing painting from the Life of St. Francis by Florentine master, Giotto di Bondone (1266 – 1337). Sadly, too many people pass right by it in their rush to the Mona Lisa room. I noticed it right away as Giotto’s work was something I enjoyed studying in back in university. Giotto was a student of famed Italian artist Cimabue (1240 – 1302), who discovered him drawing pictures of sheep. He took Giotto under his wing and became his teacher. Giotto supposedly painted the frescoes in the Upper Church of St. Francis of Assisi but the controversy surrounding this has been raging for many years. Did he? Didn’t he? Hopefully, one day we will know. Until then, this painting by Giotto, depicts St. Francis receiving the stigmata from Christ at Mount Alverno. What medievalist doesn’t know this story? The sad tale of the two Princes, Edward V and the Duke of York, aged 12 and 9, possibly murdered by their insidious uncle, Richard III. Richard III usurped the throne from Edward V in 1483 and had him and his brother declared illegitimate. I spotted this immediately – once again, few people did. It’s one of the great medieval mysteries. Although the painting itself isn’t medieval, as it was painted by French historical artist Paul Delaroche (1797 – 1856), it’s a medieval topic that has been hotly debated by scholars for many years. Was it Richard III? Were their bodies found at the Tower of London in 1674? Or were their bodies really found in Windsor Castle in 1789? So many questions left unanswered. A fascinating picture well worth a history buff’s time at the Louvre. This small, but incredible painting is easily missed if you don’t keep an eye out for it. It depicts the rebellion of Lucifer and the fall of the angels from Heaven. This painting has some pretty stunning detail, colour and imagery. It was a popular topic to depict in art during the Middle Ages. George Jetson? A ghost? No. It’s Saint Ranierius painted by famous medieval Sienese artist il Sassetta (1392-1450). While this is neither scary or macabre – it’s definitely weird looking. So what’s going on here? My French isn’t great and at first glance I thought these folks were fleeing a ghost or a monk with a jet pack. It’s actually Saint Ranierius freeing 90 poor people from a Florentine prison after they had written to him for aid. He appears to be flying and he’s definitely missing half his body. Sassetta painted this piece in Siena in 1426. It’s a curious painting and worth a second glance if you’re in the Italian section of the Louvre. Macabre much? Saint Peter was a celebrated Dominican Inquisitor who preached extensively throughout Italy against the Cathars. He was apparently very good at his job because he managed to covert many Cathars back to the Catholic fold. So why is this saint repeatedly depicted with an axe in his head? Well, after poaching a lot of their followers, the Cathars weren’t too happy with Peter so they hired an assassin, Carino of Balsamo, to kill him. On April 6, 1252, just outside Milan, Carino split Peter’s head with an axe. Peter, being the dedicated guy that he was, managed to recite the Apostle’s Creed and write the first parts of the Nicene Creed in his blood, before dying. Carino then fled to a Dominican monastery repenting his evil deed and eventually becoming a lay Dominican brother. It appears he was never punished for the crime and eventually, given even a feast day!